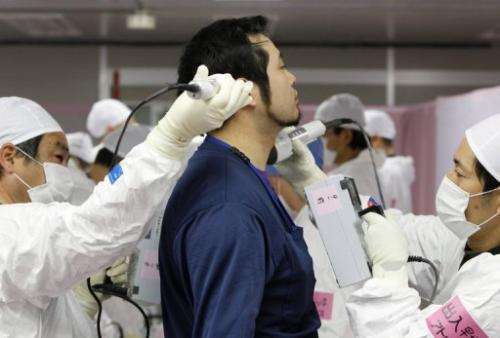 A worker is given a radiation screening as he enters the emergency operation centre at the tsunami-crippled Fukushima Daiichi nuclear power plant in Japan on February 20. To some of the men who earn as little as $100 a day to work inside Japan's Fukushima Daiichi, the plant at the centre of a year-old nuclear disaster is far from safe -- despite the official line. To some of the men who earn as little as $100 a day to work inside Japan's Fukushima Daiichi, the plant at the centre of a year-old nuclear disaster is far from safe -- despite the official line. Operator Tokyo Electric Power (TEPCO) and the Japanese government say the tsunami-crippled reactors are all in a "state of cold shutdown" and are keen to give the impression that there is just cleaning up to do. They acknowledge it is the work of a few decades -- perhaps 40 years -- but nonetheless insist things are under control. But that is not how those who spend their days inside the plant see it. "I can clearly say it's not safe at all," said one worker in his 50s, a subcontractor who has been working on the plant's cooling system since September. The man did not want to be identified for fear of losing the 8,000 yen ($100) daily paycheck he receives. "There are many spots where radiation levels are extremely high," he told AFP. The man said subcontractors like him were treated like animals. In the height of summer with the mercury rising to 38 degrees Celsius (100 Fahrenheit), workers had to go for up to three hours at a time without water because they were unable to take off their masks. 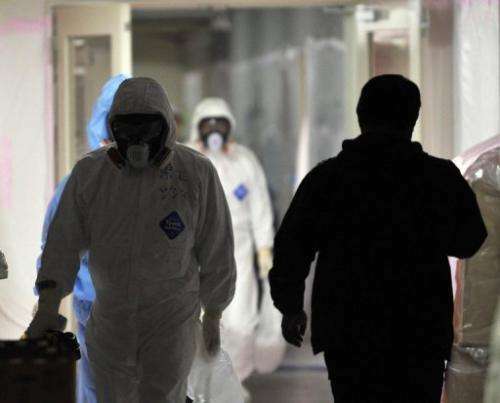 There have been deaths on site -- a 60-year-old subcontractor's fatal heart attack in May was put down to overwork, according to a labour standards inspector -- although TEPCO says none related to radiation exposure. Workers in the emergency operation centere of the stricken Fukushima Daiichi nuclear power plant in Japan on February 28. To some of the men who earn as little as $100 a day to work inside Japan's Fukushima Daiichi, the plant at the centre of a year-old nuclear disaster is far from safe -- despite the official line. Chie Hosoda, a spokeswoman for the utility, admits conditions at the plant were unacceptable in the past, with the radiation exposure of some workers left unmeasured because of a shortage of dosimeters. "But working conditions have improved now and we are strictly checking the radiation exposure of all workers," Hosoda said. Three of the four reactors at Fukushima Daiichi went into meltdown after the tsunami swamped their cooling systems last March. Fuel began to overheat and the day after the waves struck, an explosion -- the first of several -- ripped through a reactor building. Emergency workers tried to cool the rapidly heating rods with any water available, including from the sea. A month on, Tokyo finally upgraded its assessment of the severity of the nuclear emergency to a maximum seven on an international scale -- equal with Chernobyl. It was not until May 5 that workers were able to get inside the reactor building for the first time, to see the enormity of the task ahead of them. 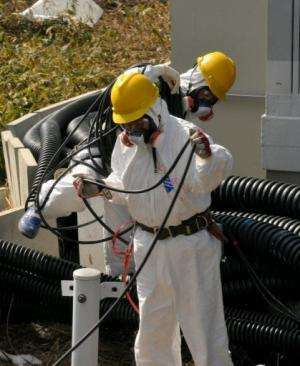 Workers at the stricken Tokyo Electric Power Co (TEPCO) Fukushima Daiichi nuclear power plant in Japan on Debruary 28. To some of the men who earn as little as $100 a day to work inside Japan's Fukushima Daiichi, the plant at the centre of a year-old nuclear disaster is far from safe -- despite the official line. Engineers, nuclear experts and ordinary electricians are among the 3,600 people working at the plant every day and TEPCO says it has no problems securing a work force despite the obvious hazards. But Katsuyasu Iida, secretary-general of Tokyo Occupational Safety and Health Centre, a support group for low-paid workers, warned the utility may face a labour shortage "if it fails to improve working conditions". Many with experience in the industry shy away from the plant. "Those who used to work at the Fukushima nuclear plant for a long time do not go to Daiichi because it's dangerous," one worker told the Tokyo Shimbun. "Payment is not good and many of them do not want to lose their jobs by risking exposure to high levels of radiation," the worker said. Workers near the stricken Fukushima Daiichi nuclear power plant Japanon February 28. To some of the men who earn as little as $100 a day to work inside Japan's Fukushima Daiichi, the plant at the centre of a year-old nuclear disaster is far from safe -- despite the official line. TEPCO says at least 167 workers are no longer able to work in nuclear plants because their lifetime radiation exposure has topped 100 millisieverts -- the upper limit for workers. Experts warn that few permanent safety measures are in place at the plant, where the initial rush to contain the accident saw a series of improvised solutions. They say that in another natural disaster -- a big earthquake or another large tsunami -- the plant could prove very vulnerable. 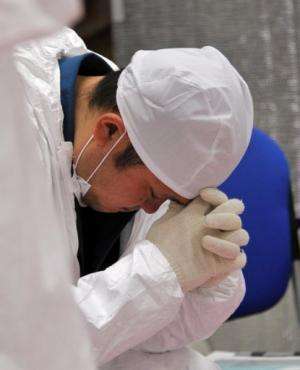 A worker takes a rest at the emergency operation centre of the stricken Fukushima Daiichi nuclear power plant in Japan on January 28. To some of the men who earn as little as $100 a day to work inside Japan's Fukushima Daiichi, the plant at the centre of a year-old nuclear disaster is far from safe -- despite the official line. "The cooling system is not a proper one for normal nuclear reactors and is still a stop-gap measure," said Kazuhiko Kudo, a nuclear reactor expert and professor at Kyushu University. News of setbacks regularly emerge. In early February, TEPCO said radioactive water had spilled out of one of the reactors after a valve in the cooling system jammed, frozen by sub-zero winter temperatures. One of the biggest challenges is that scientists do not know exactly what they are up against and can only speculate what the inside of the reactors look like -- how much of the fuel has melted and how far through containment vessels it has eaten. 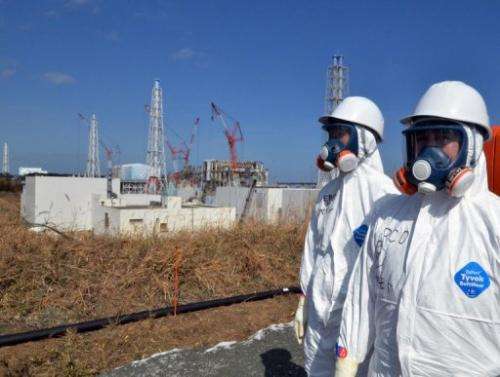 "Stabilisation of the plant is a prerequisite for an end to the accident," Kudo said, adding that containment was still a priority and the risk of radiation was still high. Freelance journalist Tomohiko Suzuki, who has written a book based on his experience working undercover at the plant last summer, said it was clearly still "in a state of crisis". "(TEPCO) was pushing for sloppy construction as it has been in a hurry to achieve cold shutdown as quickly as possible," he said. "TEPCO has to maintain this cold shutdown status for years and years to come, but can they make it happen without exposing plant workers to radiation? That's the question." Why has there been no mention of the irradiated tokyo central park? both committed suicide a few hours later. in very suspicious circumstances. with radiation spikes found 400 miles out to sea, i find it strange that the japanese would be so stupid and not tackle the problems head on. what this article and the others truly show is that the japanese government has no regard to the lives of its population. I guess the source is "Official found dead, head covered with plastic bag after measuring radiation in Tokyo park" from endthelie.com which itself is taken from the Japanese news outlet, Iza. Sounds like he was murdered to me... for whistle blowing on his blog. japanese government has no regard to the lives of its population. Well you know how Japanese like to copy the Americans. That was a really cynical and foolish remark, kochevnik. You can see there is NO safety equipment on ANY of the workers. The days of the Japanese copying Amerca have been over for decades. Must be your Stalinist education. Yes, the Japanese passed you by long ago. No safety equipment yet their life expectancy is five years higher that yours. Maybe because they spend more time cleaning and less time lying out of their teeth.